Fake gold nuggets could be very costly if you don’t know what you are buying. 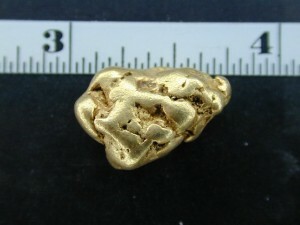 There are lots of fake gold nuggets being sold online and being marketed as genuine. This article is aimed at teaching you what to look for. Some of the people who have bought fake or man made gold nuggets on Ebay may be re-selling them and may not know that they in fact are selling man-made nuggets. The nuggets have been represented as genuine nuggets, and therefore the re-seller is just passing it on. 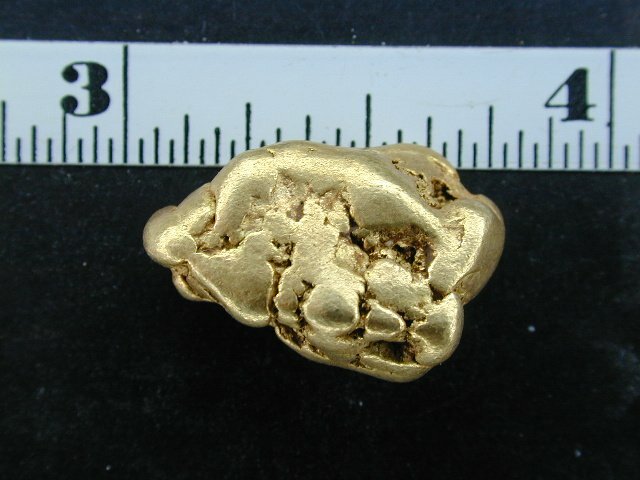 Let’s now look at some evidence of a common type of fake gold nugget in circulation. A lot of you should recognize this type of gold nugget. There was a plethora of these sold on Ebay in 2001. Myself and 1 other Ebay seller estimate approximately 50,000 grams of this stuff is floating around. Most of it was bought, and is being re-sold by people who thought they were getting a good deal. Now let’s take a look at some other types of man made or fake gold nuggets.This picture was taken at 30X magnification. In the first picture you will see right in the center of the pocket some mud-like substance (to try look natural) and a perfectly round little BB that is proof-positive, that this is a man-made nugget. The second picture shows a larger BB that had adhered to the nugget, but was polished down slightly, again proof-positive, of being artificial!! This picture of 6 nuggets together should be obvious in and of itself. These nuggets look like chips off the old block or spittin image’s of each other. For a little more in depth proof, look at these 30X magnification shots. They should really affirm that nagging doubt in your mind? 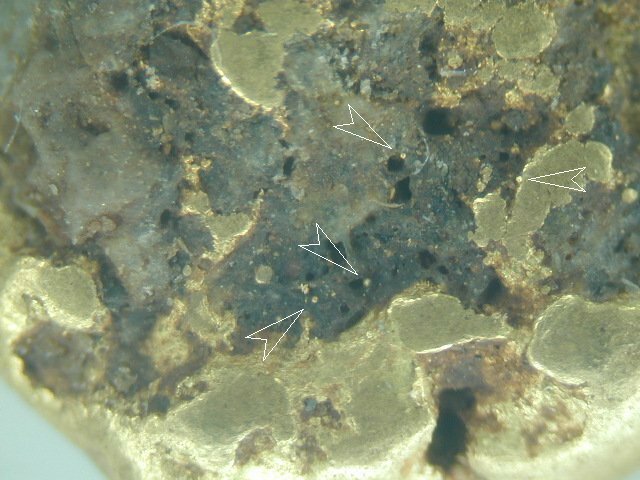 The first picture shows 4 BB’s from the melting process where the droplets fell on the mud-like substance and didn’t flow in with the rest of the gold. The second picture shows a spattering of small BB’s and mud. These things DO NOT OCCUR in genuine nuggets. YOU WANT MORE???? LOOK AT THESE!!! There are bunches of these around as well. These are considered the worst of the fakes. The reason for that is because they are a pathetic attempt at making a natural nugget. They are BLATANTLY OBVIOUS FAKES. Now with you being the intelligent person that you are, I ask you this question, “Why are some gold nuggets so smooth and pounded?” Of course you know the answer to that is because they have been in the creek or river! Now ask yourself this. What kind of rocks do you see near a creek or river? They are rounded and smooth, aren’t they? Just like the gold!! 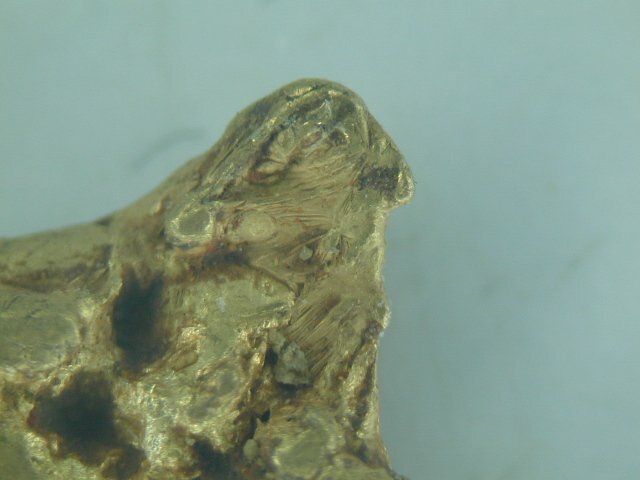 So HOW IS IT POSSIBLE FOR A VERY SMOOTH GOLD NUGGET TO HAVE SHARP AND COARSE CHUNKS OF ROCK IN IT? Your right!! IT ISN’T!! You just answered the question for yourself!! The second picture shows an air bubble as well that popped as this fake was cooling!!! NOPE WE AREN’T DONE YET!! This is an attempt to make the nugget look like its a quartz and gold specimen. Quarts does in fact come in a variety of colors, and yes dark brown or black is included, but lets look at this one at 30X magnification. As you will again see, there are a bunch of BB’s sitting on top of this mud stuff. The other thing you will notice here is that along the edges of where the gold meets the pseudo quartz the gold is mushed out, or rolled over from polishing. And again why is the quartz not rounded and smooth like the rest of the nugget?!! JUST A FEW MORE, AND YOU WILL BE AN EXPERT!! AND NOW FOR THE LAST 2!! This one is tougher to tell by just looking at this picture, but look under 30 power. The give away here is the little pools of brighter, and more yellow deep areas of the nugget. These areas have zero scratches and are not worn at all. There is no way for the manufacturer to polish these low lying areas, and therefore still retain the melted appearance. In nature these low lying areas DO get worn from the millions of particles of sand that travel over them in the creeks and rivers. A nice rough nugget!! Ever see an aluminum can after its been in a camp fire? Or a piece of tin foil from a cigarette pack? Looks pretty similar to this top portion of nugget!! Now YOU can tell!! This is the same nugget after it has been heated to red hot, with a mini torch, then allowed to cool. If you have a nugget you have decided is suspicious you can use this test, to reaffirm your suspicions. How the test works is basically this. 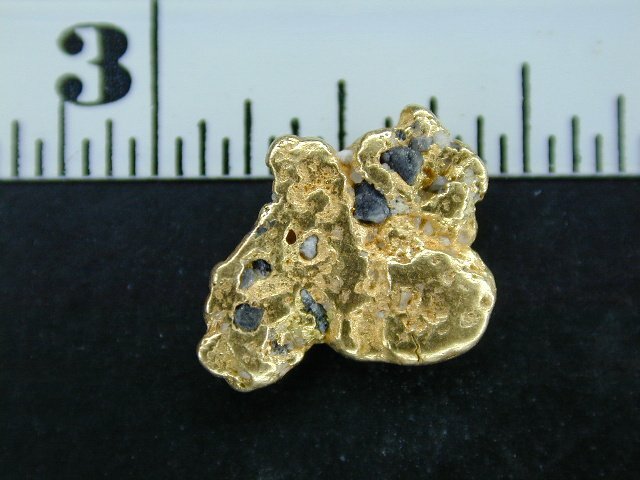 The man-made nuggets are made from scrap jewelers gold, or gold dust with alloys added usually. One of the common alloys is copper (14k gold has gold, silver, and copper as a rule), when copper is allowed to heat in the air and then left to cool it forms two by-products. The first is a black oxide (that you see in the sample above) called cuprous oxide, the 2nd is a pink and harder oxide called cupric oxide. Since most natural nuggets contain only a small amount of copper they generally don’t turn this black from heating and cooling!! You may get some smaller black spots on a natural nugget, and even get other discolorations because of many types of natural alloys. You can use a wind-proof cigarette lighter, butane mini-torch (available on Ebay for about 10 bux), or a welding torch even, (be careful!). Heat the nugget to cherry red, and let it cool!! If it shows a high degree of black on the nugget, (like in the example above) it is another indicator pointing towards a man-made nugget. At that point you should get an expert to examine your nugget for you, to fully decide. I will do examinations for you at no charge as long as shipping is paid both ways. An experienced jeweler may be able to help as well!! Good Luck on NOT finding too many black ones!! VERY SCARY, PLEASE PASS THIS PAGE ON TO FRIENDS! THERE ARE STILL LOTS OF FAKES OUT THERE. Thanks for the great information. Even though I haven’t purchased any gold, on-line, for some time, I find that you are the only one I would even trust. I do my panning in Vermont. Always do well and have a nice relaxing time. Thanks again.